Inspired by @kmac1036 and his "mobile rig setup" post, I thought I would share a few pictures of my live stream studio, which is a work in progress, but up and running for maybe 4 weeks. I was fortunate to have a large space in our showroom, actually an entire building connected to the headquarters office, that I was able to take over. Not only that, but high vaulted ceilings perfect for lighting equipment, and also room depth so I can work with shallow depth of field to defocus the background behind my on-camera talent. The "set" was already here -- an existing showroom. 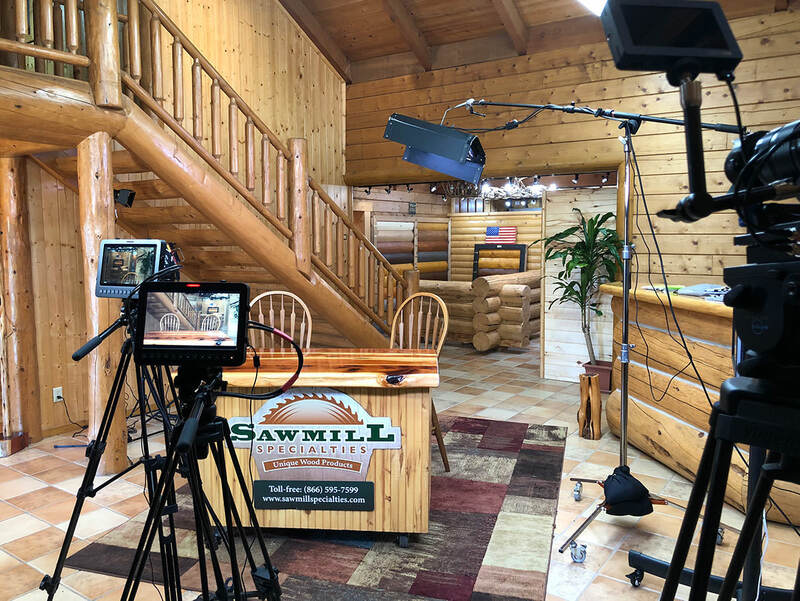 I relamped all the practical fixtures with 5500K daylight bulbs, then added daylight balanced Kino Flo Divas and various Aputure LED instruments to light my talent and to add emphasis on products and lift the woodwork out of the shadows. By YouTube and Facebook standards, this is great set, but again, just an existing space available to me. One challenge is a major high speed 4-lane highway just outside. Heavy traffic, including noisy trucks, operate at 70 mph / 112 kph just 40 feet / 12 meters behind the cameras. 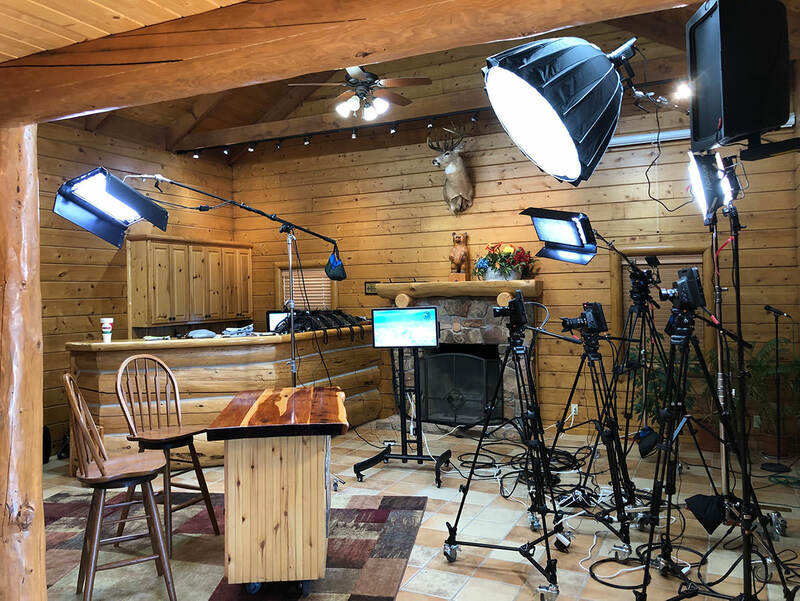 Thanks to heavy log walls and thick sound blankets hung over doors and windows facing the highway, plus careful close mic placement on talent, all the highway noise is barely noticeable in the videos. View of the "set" -- one vantage into our showroom. Actually, I think I can turn the cameras and lights to get 3, maybe 4 distinct sets in this space. Outside the views presented here, I can move in different furniture such as sofas and chairs to frame up alternate sets against the fireplace, for example. 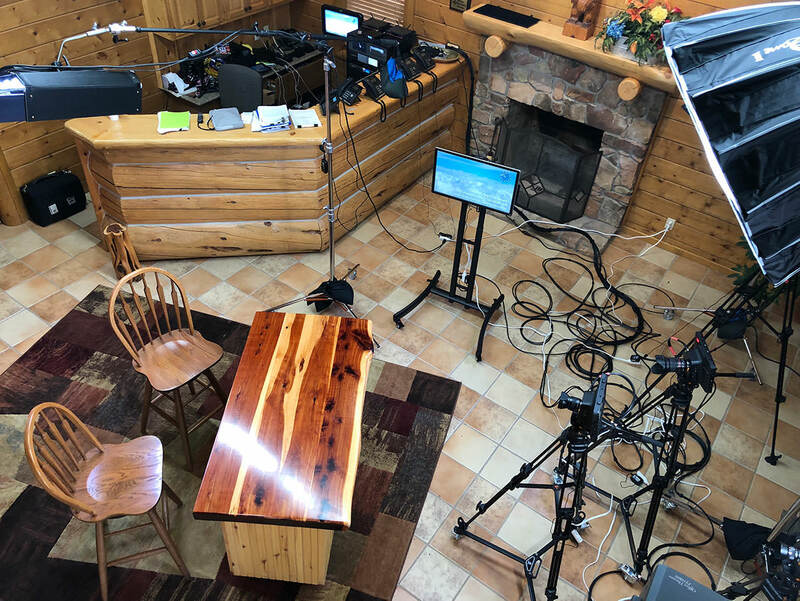 I set this multi-camera studio up with 3 Blackmagic 4K Studio Cameras, plus a Studio Camera Mini with an iPad teleprompter (we already had teleprompter). Optional signal sources include 2 additional Panasonic GH4 4K cameras. Yesterday was my first 2-person interview, and in future I will definitely rig the GH4s for over-the-shoulder cutaways. I also have a Blackmagic HyperDeck Studio Mini, which has a terrific capability to interface to the ATEM switcher and instantly roll prerecorded video upon switching to its input. A Blackmagic UltraStudio 4K for mimoLive rounds out my input signal devices. NOTE: UltraStudio 4K cannot output key and fill from mimoLive except at 1080p. This is not a problem with mimoLive, but an unhappy limitation of the Blackmagic hardware. This is my #1 disappointment in building this studio. Thanks to Boinx for researching all this, and sorry I tortured you with technical support burdens which turned out to be 100% a Blackmagic problem. The Epiphan Pearl Mini we are using as an encoder tops out at 1080p. I have no intention of streaming 4K anytime soon, if ever. However, I designed this system with a 4K signal path throughout with intention of capturing everything at 4K using the AtomOS SUMO for archival purposes. Who knows what the future holds? Facebook and YouTube may fall to competitors -- there's no denying that Apple and Amazon have a media delivery capability, even if their current focus is only Hollywood and commercial content. Hollywood and Network programming may itself fall victim to YouTube-style creator content. No individual, no technology, no platform is eternal. Reality is, I have access to people and experiences that are unique to my niche with potential to capture content that will be relevant long into the future. So I want to archive my productions in ProRes at 4K and not rely on Facebook or YouTube to be my repository. Taking responsibility for my own program files and backups protects this programming and future proofs the content for whatever delivery platforms that may come. Balcony view of the studio. Sorry for the messy install -- all the cables and wires strewn about need to be cleaned up. Building this studio took weeks longer than expected because I am a complete newbie with all the key technology - no prior experience with building a live production studio, no experience with Blackmagic gear, no experience with mimoLive, no experience with Epiphan Pearl Mini, no experience with Facebook or YouTube live streaming (other than a few hit-or-miss experiments at intervals too long to retain knowledge, much of it simple iPhone tests). When I get up to speed, my design for this studio aims to be able to tear down and store all the lighting, cameras, and cables in about 60 minutes. We do use this space for other purposes on occasion. I estimate it will take me, with no help, an hour to take down and maybe two hours to set it all back up. The "control room" space is more permanent, dedicated now to live streaming. So all that gear remains in place. very nice @"Danny Grizzle"! and I want one of those cameras! Note equipment, left to right: AtomOS SUMO19 on C-stand, rack with Blackmagic equipment plus Behringer X-Air XR18 mixer, a couple of small 20-year old Behringer SHARK DSP110 temporarily installed and set to add 190 miliseconds of audio delay to compensate for video latency, Blackmagic ATEM TV Studio Pro 4K switcher, MacBook Pro running mimoLive, Epiphan Pearl Mini encoder (between the two laptops), my work laptop, and bottom edge of photo, a Mac Mini running control software for ATEM (controlling exposure and color grading, plus downstream keyers) and the X-Air (EQ, compression, and Automix functions). One nice bonus of taking over an unclaimed showroom for a studio is beautiful wood bar top and granite countertops, plus abundant cabinet space for storage of all the wires, batteries, microphones, lenses, and other junk that comes along with production. BTW - 4 of the 6 telephone handsets seen on the bar top at rear of this photo are being configured to take live call-ins. We will have dedicated telephone numbers, etc. I have yet to roll out any interactive elements for audience participation, but depending on mimoLive to get chat/IM/emails etc into the live stream feed. want, want, want, lol. Hey @"Danny Grizzle" you can add the audio delay in ML. @kmac1036 I'm using mimoLive strictly for CGI and pre-recorded content like still images, all delivered into what is essentially a Blackmagic workflow via a Blackmagic UltraStudio 4K interface delivering 2 channels (key and fill) into a Blackmagic ATEM switcher. I'm using an Epiphan Pearl Mini as a dedicated hardware encoder. We configured our fiber optic connection with a VLAN giving the Pearl Mini protected bandwidth, so regardless of whatever anyone else here is doing online, there should never be any latency or dropped frames video streaming. Pearl Mini is capable of feeding two simultaneous live streams, so I deliver both Facebook and YouTube simultaneously, each one configured to the exact specification of the target network (currently 720p for Facebook and 1080p for YouTube). No audio passes through mimoLive in my workflow. The Epiphan Pearl Mini also has audio latency adjustment, but since video has to be scaled down to 1080p before being presented to the Pearl Mini's inputs, and because I want to archive at 4K, I found it necessary to adjust for latency upstream of the encoder. I wish the Behringer XR18 had audio delay, but it does not. There is one guy on YouTube who posted a kludgy workaround, but his channel has gone inactive. Behringer's X32 Rack does have delay, but I already owned the XR18 and didn't budget for a new mixer. The SHARK DSP110 are also something I've had on hand for many years. I was reluctant to put them in my signal chain because they are a kludgy solution and add an extra roundtrip through A/D and D/A conversions, but at this point, I need to make this thing work without spending more money. Actually, I was surprised that the audio through the SHARK delay line sounded fine to my ears, though I have not had a critical listen. Not optimum, but it works for now. hmm ok. looks like you have a lot of hardware doing the heavy lifting! I haven't had a huge hardware budget or static studio or spot I could set up for mine, we usually meet a public library in whatever room they decide to give us. so that was the philosophy behind my rig. so glad you posted yours as another example of what you can do! mimoLive is extremely flexible. 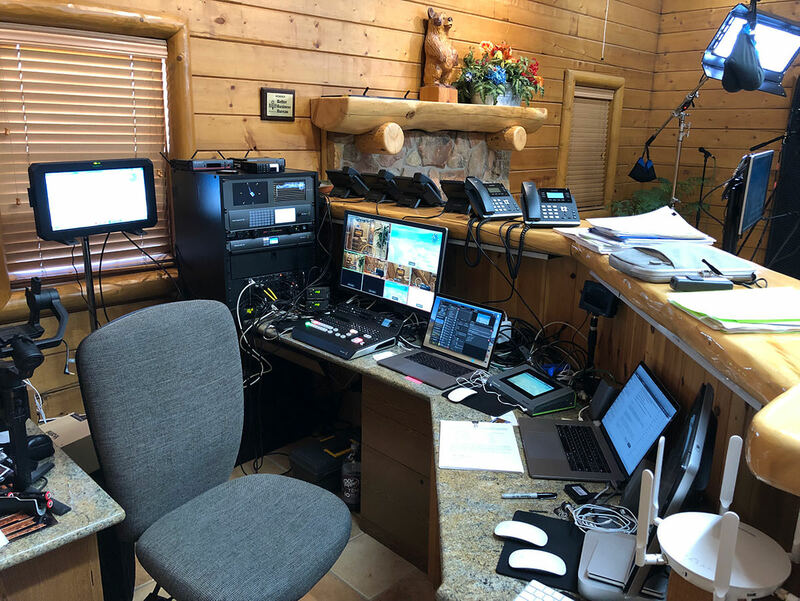 I've been around since the dinosaur days, and can say mimoLive has capabilities that rival a lot of the old school industry standards like Chyron, systems that used to cost hundreds of thousands of dollars. In today's production environment, mimoLive has amazing capabilities far more comprehensive than a dedicated graphics box. At the same time, mimoLive adds tremendous value in a more traditional hardware-based workflow. Blackmagic Design has done some very innovative things and been very disruptive in the market by delivering quality that rivals old school industry veterans, but at breakthrough prices. Blackmagic has also made some very astute acquisitions, and now owns some of the premiere technologies in the industry. Anybody who has been to NAB in recent years knows what a dominant presence the company has assumed in the market. mimoLive brings a lot to the party, and definitely enhances the graphics capabilities of a Blackmagic workflow. At the hardware level of Blackmagic ATEM switchers, graphics capabilities are actually quite rudimentary, very limited still store and weak abilities for manipulation in the hardware. mimoLive is far, far more capable, and really adds value to a Blackmagic workflow. But you are correct, dedicated hardware also has its place, and using dedicated video switchers and encoders like I am doing with Blackmagic and Epiphan gear in conjunction with mimoLive takes a huge load off mimoLive, or more accurately, using external dedicated hardware reduces processor demands of trying to do everything on the processor inside a Macintosh, which is after all a general purpose computer, not a purpose designed device like Blackmagic ATEM or Epiphan Pearl. @"Danny Grizzle" definitely agree, products like ML, BMD, Newtek, possibly a couple others have been very disruptive. When I went to school in 2001 they were still using 3/4" tape. What we're doing was definitely 6-7 figures worth of equipment just 15-20 years ago. It seems you're going to spend some on hardware, whether it be something like your setup, or on a machine that can handle all the I/O... there's pros and cons either way. It's just interesting how many different options you have today versus when I started with BoinxTV back in the late 2000s. If I were handed $4-5k, my setup would be vastly different than what I have now & it would definitely still be a quality production imo. Broadcast isn't even my day job, I'm just a volunteer. 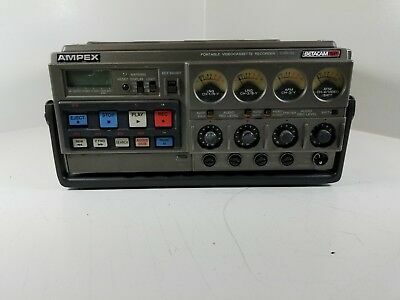 Just to put this into perspective, the budget for this entire studio was about what a single portable battery powered Betacam SP deck cost in the late 1980s, just before the emergence of broadcast camcorders. Even allowing that we had some of the equipment (Kino Flos, Matthews stands, laptop computers, M43 lenses, etc), a simple camera-lens-recorder-tripod package back in the 1980s (Ikegami HL-79EAL, Betacam SP deck, Anton-Bauer batteries, Canon broadcast zoom, and O'Connor fluid head tripod) would have cost probably 4x our gross budget to bring this entire multi-camera studio online. Too often, when people approach this from the vantage of a Canon Rebel with a kit lens, I see a ridiculous amount of complaining, and sometimes berating vendors about their pricing or licensing models. That's absurd. People need to consider that they don't buy a product like mimoLive, they invest in an ongoing relationship. I'm talking about people who tie their career to doing this stuff. Part of being a professional is paying your bills and supporting your vendors because if a key vendor fails, that can be devastating to your workflow, production infrastructure, scheduling and delivery, facility design, and training. Being in business in not simply a matter of buying a camera. I tell people all the time, "buying a piano is easy compared to learning to play it." Even this is grossly understated, because it is one thing to be a great pianist and entirely another to build a career as a successful musician. @"Danny Grizzle" you are not wrong! our old sony 3/4" backpack setups at the college were at least $10k each when they were new back in the late 70s / early 80s. the fact we were still using them in the early 2000s goes to show they were all built like tanks, and felt like it when you carried them around too. Blackmagic Studio Camera 4K are little more than an iPad with a camera upgrade and serious video connectivity. One warning everyone will give you: these cameras have zero low light capability. You must have studio lighting levels - ambient indoor lighting won't do, not even bright office lighting. I have tons of tripods and could have used a mismash assortment, but B&H sells a studio fluid head in studio configuration with a wheeled dolly floor spreader for about $250. (E-image brand) I took a chance, thinking they would be junk at that price, but they've been very satisfactory, and an amazing value. It would be easy to skip the Blackmagic SmartVideohub that is at the heart of my rack, but taking it out of the system would be to doom yourself to constant rewiring. It would be like owning a car where you had to spend as much time beneath it with mechanic's wrench as you did driving it down the road. As a line item cost, one of the most expensive things in this studio is all the SDI cables. If I had the time, it would have paid to buy the tools and make my own. There is a guy on YouTube - Doug Johnson Productions from Orem, Utah - who has an excellent channel covering all this type thing. About the cameras. One cool thing about Blackmagic studio cameras is the remote control that is built in. Each camera has two SDI cables - an output and a return from the ATEM switcher. One thing I needed in a multi-camera setup was tally lights, so the talent would know which camera to address. This system also has talkback, so camera operators can wear a headset and the director can setup shots. In my case, I'm not going to routinely use camera operators. These cameras use Micro Four Thirds lenses, the same ones as a Panasonic GH4 or GH5. Not understanding the full remote capabilities, I originally planned to adapt some existing Canon EF and Rokinon glass. But it turns out that native Panasonic and Olympus M43 lenses can be fully controlled remotely from the ATEM switcher, including iris, focus, and zoom (if the lens has power zoom... none of mine do). This is all very handy for one-man-band multi-camera production, especially working at large apertures and shallow depth of field, to be able to finesse focus as talent adjust their body position. The other thing the Blackmagic cameras do is color grading via remote. Blackmagic's Ursa series cameras can also be used, but one reviewer noted that the URSA series of production cameras may have a different processing latency than the studio series cameras. Specifically, this guy says he is using the Blackmagic Studio Camera Mini because it has zero latency, which is essential for him because he is a true one man band YouTuber, appearing as on camera talent as well as performing all switching. Because he wears ear buds to monitor his stream, he cannot tolerate any latency at all because it is impossible to speak while listening to an audio delay in your earphones. That guy, who goes by PhotoJoseph on YouTube, does a variety of photographic related content, but he also covers what he learns about live streaming. Anybody who is interested in what I am doing, the two sources I'd turn to are PhotoJoseph and Doug Johnson on YouTube. Also, the Epiphan channel on YouTube is worthwhile. I value these three above a lot of the other DIY streaming info sources on YouTube because too many of the others deteriorate into hacking PCs and building gaming platform-type builds and messing around with software encoders. That's a big bag of worms, maybe fine if you already have the skills, but my thinking is streaming is already too complex and I'd drown if I got bogged down in hacking builds of Frankenstein computer hardware. Your milage may vary, but I don't. We have to know our limitations. @"Danny Grizzle" thanks for the info, I'll have to look up those youtube sources sometime.